Introducing a conferencing phone that expands to fit your needs. Integrating ClearOne's industry-leading professional audio technology and advanced processing, Max EX Conferencing Phone brings you unbelievable clarity, unique expandability and incredible ease of use. Link up to four phone units complete with microphones, loudspeakers and controls for an even distribution of sound. With Max EX Conferencing Phone in meetings, not only can discussions flow more freely, so can productivity. Max EX Conferencing Phone is unique in its expansion capabilities - you expand it by connecting additional phone units, not just microphones. This creates an even distribution of microphones, loudspeakers and controls for better sound quality and user access. No matter where participants are seated, conversations are natural and effortless. 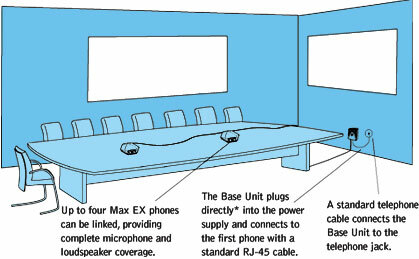 Up to four Max EX Conferencing Phone can be connected to accommodate different room sizes. Max EX Conferencing Phone features advanced audio technology typically found only in-high-end installed systems - with Gentner Distributed Echo Cancellation, noise cancellation and advanced microphone activation processes - so you can count on clear highly intelligible audio for effective, interactvie conferences. Setting up the Max EX Conferencing Phone conferencing phone is extremely easy and requires only three connections: power, telephone line and base unit. The familiar keypad design ensures users will be comfortable using the phone, which reduces the need for training and support. Max EX Conferencing Phone is unique in its expansion capabilities--you expand it by connecting additional phone units, not just microphones. This creates an even distribution of microphones, loudspeakers and controls for better sound quality and user access. No matter where participants are seated, conversations are natural and effortless. Up to four phones can be connected to accommodate different room sizes. Max EX Conferencing Phone features advanced audio technology typically found only in high-end installed systems--with Gentner Distributed Echo Cancellation, noise cancellation and advanced microphone activation processes--so you can count on clear, highly intelligible audio for effective, interactive conferences. The clear, full sound of the Max EX Conferencing Phone facilitates more natural interaction between participants. Press a button and access a conferencing-service operator who can connect an unlimited number of participants. Intuitive, user-friendly controls are simple to operate. Setting up the Max EX Conferencing Phone is extremely easy and requires only three connections: power, telephone line and base unit. The familiar keypad design ensures users will be comfortable using the phone, which reduces the need for training and support. 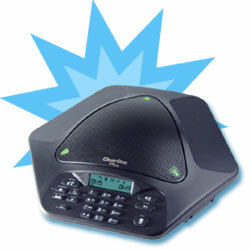 The Max EX Conferencing Phone is ideal for customers who require high-quality audio, ease of use and flexibility. Already perfect for small meeting rooms, Max EX Conferencing Phone can be combined or separated to match the size of virtually any room in your organization. Whether you conduct your meetings from a large boardroom (three phones), a training room (four phones) or a conference room (two phones), you can easily create the optimal conferencing system with Max EX Conferencing Phone. Click here to view the Max EX data sheet/product brief.